Former England captain Michael Vaughan says new coach Peter Moores will gel better with current captain Alastair Cook than he did with Vaughan. 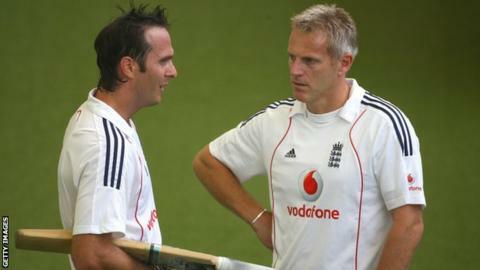 Moores first led England in 2007 and Vaughan recalled: "His style wasn't perfectly suited for me as captain. "I liked to be at the forefront, the guy that motivated, and Peter was kind of similar so in a way we clashed. "Cook doesn't like to do much talking in the dressing room and Moores does so this could be a good combination." "In his first news conference, Moores repeatedly used the word 'togetherness', and it was interesting to hear managing director Paul Downton offering a little more insight into why Kevin Pietersen was such an obstacle to that unity. "But I very much doubt Downton's words will put the debate to bed. Even today, Pietersen sent out a tweet saying that 'everyone deserves a second chance', and I have even seen the suggestion that the ECB only sacked Pietersen in order to reinstate Moores. "Ridiculous as that claim is, the only way Moores will truly be able to shake off the Pietersen issue is by getting results." During his first spell as England coach, between April 2007 and January 2009, Moores presided over 22 Test matches, winning eight, losing six and drawing eight. Vaughan, England's most successful Test captain with 26 wins from 51 matches, resigned from the England captaincy during the home series against South Africa in 2008 and confirmed his retirement the following June. Moores was sacked in January 2009 after a breakdown in his relationship with Vaughan's successor Kevin Pietersen. "He was the kind of guy who would come in and try to re-galvanise a side that was pretty fine at the time, but his methods with the seniors, Pietersen, myself, [Paul] Collingwood, [Andrew] Strauss - players that had been around for a long time - didn't quite work," Vaughan told BBC Radio 5 live. "But with a lot of younger, fresher players coming in throughout the summer, a captain in Alastair Cook who I identify as a someone who just likes to lead from the front in terms of the way he bats, Peter Moores' style of coaching is probably perfect." Moores will take charge of the England Test, one-day international and Twenty20 teams, having been appointed ahead of the former limited-overs coach Ashley Giles, who had been widely regarded as favourite for the job - and Vaughan said Giles could consider himself hard done by. "I do think the ECB [England and Wales Cricket Board] have sent him down the river," Vaughan said. "I think the plan was for him to take over from Andy Flower but I don't think he ever got the England side he wanted. "They were always resting players and the Ashes was the key format England were concentrating on throughout his reign, and then at the Twenty20 World Cup again it was not with the best side, so I feel for Ashley Giles." Former England batsman Geoffrey Boycott believes Giles was not the right man for the job and has urged Moores to follow the example of Australia coach Darren Lehmann. Lehmann took over from Micky Arthur before last summer's Ashes series and, even though Australia lost that contest 3-0, they turned around their form to beat England 5-0 in the return series down under last winter. "Moores has to strike up a good relationship with the managing director Paul Downton and captain Alastair Cook, but the one thing that I don't want to see is a cosy comfort club. I don't think that solves anything," Boycott told BBC Radio 5 live. "Look how Lehmann came into the Australian team. He shook everything up. He didn't fall out with anyone. "He is his own man - ebullient, confident and cocky. We want something different, we don't want another Alastair Cook - let him be himself. We want the coach to be different." Boycott added he was "worried" England would appoint Giles, "who is just a nice lad like Alastair Cook". "I'm sorry, I'm not a supporter of Giles performances, his statements or anything," said Boycott.